Since I don’t read right-wing blogs or the L.A. Times with any regularity, I missed last winter’s most pressing political news story: Ornamentgate. transformed the leader of the world’s most populous nation into a vapid superstar — the most famous of the famous. The portrait photo from Mao’s Little Red Book is tarted up with lipstick, eye-shadow and other Marilyn Monroe-style flourishes.Where did the Christmas decoration come from? 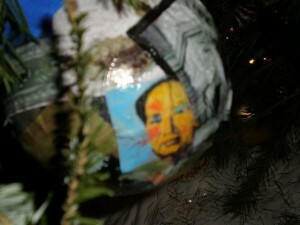 The precise source of the Warhol ornament is not known. But Warhol’s Maos are in art museum collections from coast to coast, including the Museum of Modern Art in New York, the Art Institute of Chicago (whose painting most resembles the ornament image) and both the County Museum of Art and the Museum of Contemporary Art in Los Angeles. Not surprisingly, Pittsburgh’s Andy Warhol Museum has several. Oh, and at the other end of Pennsylvania Avenue from the White House, the National Gallery of Art has 21 different versions of Warhol’s “Mao.” Twenty-one. Wait until Big Government bloggers find out about the Communist takeover of the National Gallery. I discovered this most important of national holiday stories while poking around the Web the other day investigating a trend I’ve noted in recent years: the proliferation of Warhol-designed Christmas paraphernalia. It started with Christmas cards. You’ve probably seen dozens of cards by Warhol around this season (and in recent years) at hip little book and paper shops without realizing they were Warhol’s. 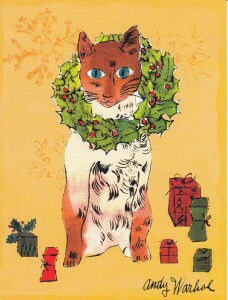 The site art.com has dozens of Warhol holiday designs available, not only on cards, but also prints suitable for framing, which I suppose you’d store away somewhere for the rest of the year when they’re less seasonably appropriate for your wall space. In New York? Really? 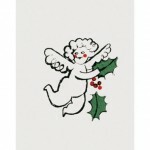 Some of them are fairly traditional, such as “Angel, 1957 (with holly)”; others seem to be cheeky nods at the holiday’s commercial excess, if not at the consumer origins of Warhol’s images themselves. 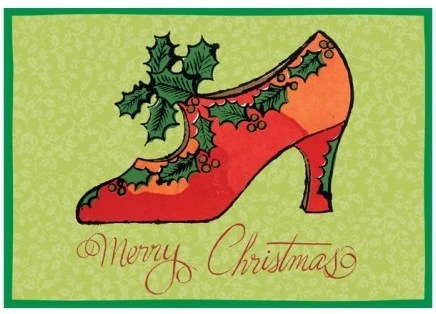 I hope WikiLeaks is on top of this issue: we have the right to know if our elected representatives are sending out holiday greetings using subversive Warhol shoe designs, which could suggest that religion has been supplanted by capitalist commodity fetishism. Imagine! It turns out that the right-wingers need to chill a little: Warhol’s Christmas designs have been deemed safe by kids-crafts bloggers. I was relieved to find that someone at artprojectsforkids.org was selling do-it-yourself Warhol Christmas tree murals, though I’m not sure how the Warhol Foundation would feel about the copyright issues involved. Grinches. People who knew Warhol testify to his punctilious generosity in giving well-chosen Christmas gifts. He believed in the American Christmas, just as he believed in Elvis and Marilyn. He knew a collective dream when he saw one. In his 1981 painting Myths, he portrays 10 American icons of the supernatural and the superhuman. Together with the Wicked Witch of the West, Uncle Sam, Dracula and Mickey Mouse, there is a slightly disreputable Santa Claus. It is Rockwell’s Christmas deity who held the boy in his hand, made seedily real. A man dressed up, a store Santa. In his last years, Warhol’s art suddenly became more personal — although at the time no one recognised it. It seemed logical that he should start a series of paintings based on a reproduction of Leonardo da Vinci’s Last Supper — in the 60s he had done a Mona Lisa. In fact, by making his own religious art, Warhol was expressing himself. It became public knowledge only after his death that he had been a regular church-goer who remained loyal to the piety of his immigrant mother. He habitually did charity work with homeless New Yorkers at the Church of Heavenly Rest, whose rector recalled that Warhol served food and cleaned up at communal meals — you think again of those lonely soup cans, those generous Christmas cards. There’s a photograph of Warhol serving charity meals at his New York church. There are no decorations up, but still I see Christmas in it. “It is required of every man that the spirit within him should walk abroad …” says the spirit of Marley in A Christmas Carol: walk abroad and touch other souls. Andy Warhol’s does, more than most. Thanks, but I prefer a Warhol that can be snarky, even at Christmas Mass, one who can poke fun at Americans’ commercial excesses even as he profits from them. Can’t we revive some holiday traditions that preserve a little authentic Warholian spirit (if the idea of an “authentic Warhol” isn’t too much of an oxymoron)? How about annual screenings in Union Square of “****” (otherwise known as the “25-Hour Film”), which includes a 33-minute segment of a 1966-67 Greenwich Village production of A Christmas Carol, staged at Caffe Cino, with Warhol hanger-on Ondine as Scrooge. Mick sat down next to Bob Colacello and put his arm around him and offered him a pick-me-up, and Bob said, “Why yes, I am rather tied,” and just as he was about to get it, Yoko and John Lennon walked in and Mick was so excited to see them that he ran over with the spoon that he was about to put under Bob’s nose and put it under John Lennon’s. Halston and Loulou de la Falaise put a lot of the pick-me-up in a covered dish on the coffee table and when someone they liked would sit down they’d tell them, “Lift it up and get a surprise.” Paloma Picasso was there. Jay Johnson brought Delia Doherty. The dinner was terrific. Mick and Bianca forgot to bring out the dessert, though. Then again, maybe conservatives should be a little unsettled by Warhol. Let them rail. Do we really want to live in a world where Warhol’s joined forces with Walmart? p.s. Dear Andy Claus, I wouldn’t complain to find this in my stocking either. But I’d rather you buy it from McNally Jackson than some online megachain. Great posting! “Dear Andy Claus” – classic. I saw Andy Warhol walking up Fifth Ave. in 1987 way back when I was just visiting the city. He didn’t seem to bounce when he walked. He rather floated. Thank you for the graphics. Fantastic artwork.